It was back to work yesterday, but I still have a few moments to share from Sunday’s workshop… we started the day with an impromptu watercolour Jacaranda challenge to see who could get the closest colour to these stunning blossoms. 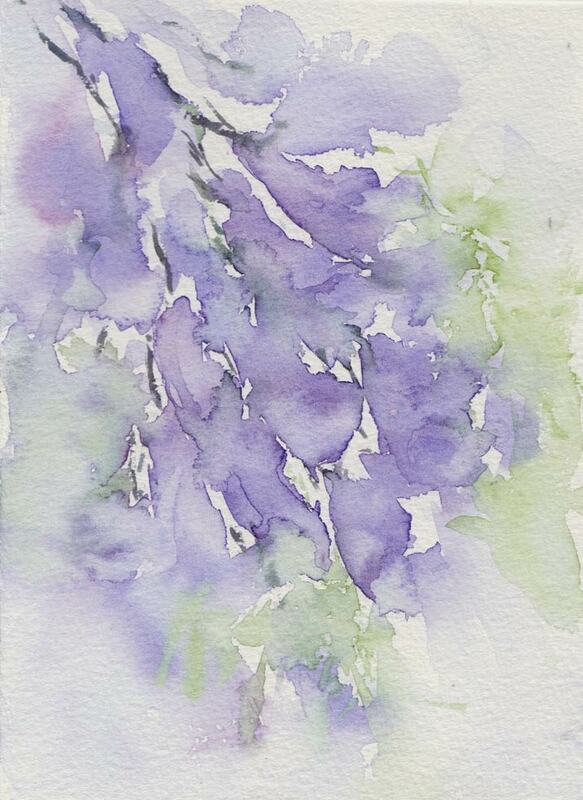 I don’t think I won the colour match with mine (pictured here), mixed from Quinachridone Magenta and Phthalo Blue, but I did get a ‘Wow’ for the brush work and looseness which was very exciting 🙂 . Following on from this we watched a number of superb demonstrations of Jean’s renowned animal eyes, both of cats and dogs, watching as she worked from a photo of a King Charles Spaniel someone had brought along. After lunch we got to indulge our own enthusiasm and splashed some paint around and I now have several part finished pieces to continue working on now I’m home. We also watched while Jean tackled some of the problems that were being faced around the room using attendees photos, demonstrating and explaining how she would approach the subject. It was really useful to hear her thought processes and problem solving methods as she worked through each one – pretty brave of her too… most instructors won’t stray from the set pieces they have prepared beforehand. Now it’s back to my quiet spare room and the challenge of keeping that spark of excitement going. I will certainly be looking our for a class or a painting group to join now, it was so inspirational to have like minded people in the room for encouragement and an experienced tutor for guidance! 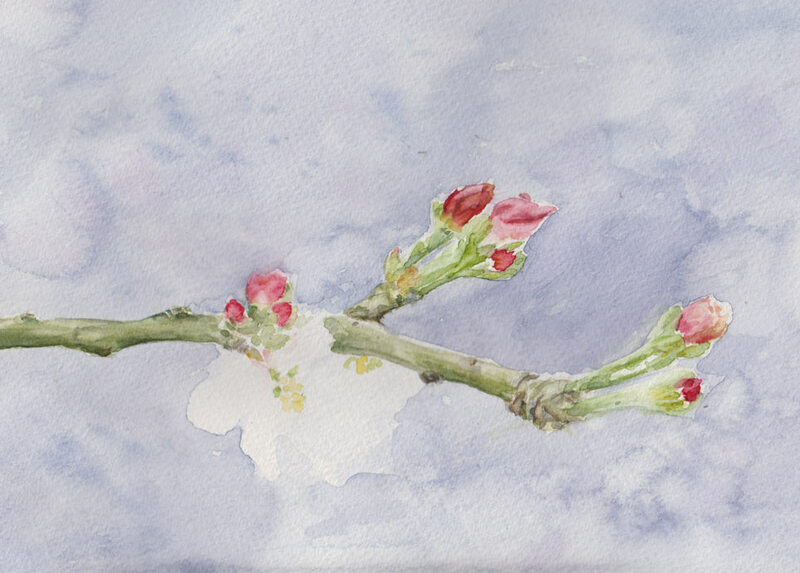 Not much going on this week I’m afraid, but I did take time yesterday for a small watercolour study of the blossom on my second apple tree, which has just started blooming. This one was a recent birthday present from Jim and grows Granny Smith apples (hopefully!). I decided I needed a second tree because the first one hasn’t given us any apples so far in the five years we’ve had it… they keep falling off when they’re still small, so I wondered if it needed a pollinator. We’ll just have to see how they both get on this year 🙂 . This tree is a dwarf ballerina style, so it’s cultivated to be about a metre high and only produce small branches all the way up the trunk so what you see here is the entire length of a branch. I was fascinated to see just how different the blossom is on my new tree, the buds are a much deeper red, and no leaves yet just flowers and buds. For reference the study I made of the other tree, which is a Gala apple, can be found here. Colours used here: Alizarin Crimson, Indian Yellow, Sap Green, Indanthrene Blue and Burnt Sienna. It’s Friday again… my hasn’t this week gone quickly? I know! I’m beginning to sound like a broken record, but this year has flown by so far. The garden is changing faster than I can cope with as Summer gets closer and I think the grass has been taking lessons from Jack’s beanstalk, so I really had to find an hour today to cut it. 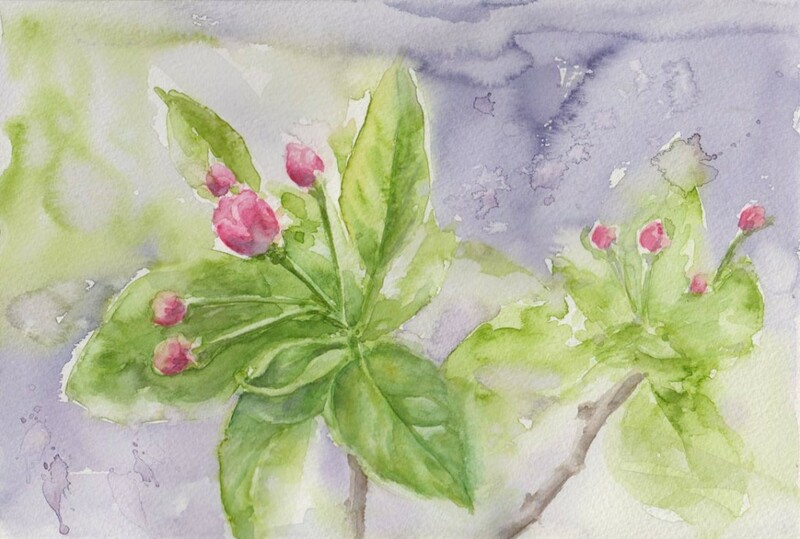 Later on I stood at my drawing board and wondered about continuing with the Alpaca, or putting a few more marks on the Plum Blossom, but something had caught my eye while I was outside… just three small clumps of leaves unfurling on the apple tree with little pink buds nestled in the middle of them. Too tempting!! So I headed back out with a camera and here’s the start of a study… incidentally, the colours here are fairly true to life, they really are the most amazing pink! I’m quite excited to immerse myself in Plum Blossom again, especially as it’s completely disappeared from the garden now – it’s sad how quickly it all blows away, but it does remind you to grasp the moment! As well as excited, I’m also nervous about that large expanse of background and trying to fill it with foliage type splodges without painting every leaf… I can’t imagine how I’m going to do it and not create mud. 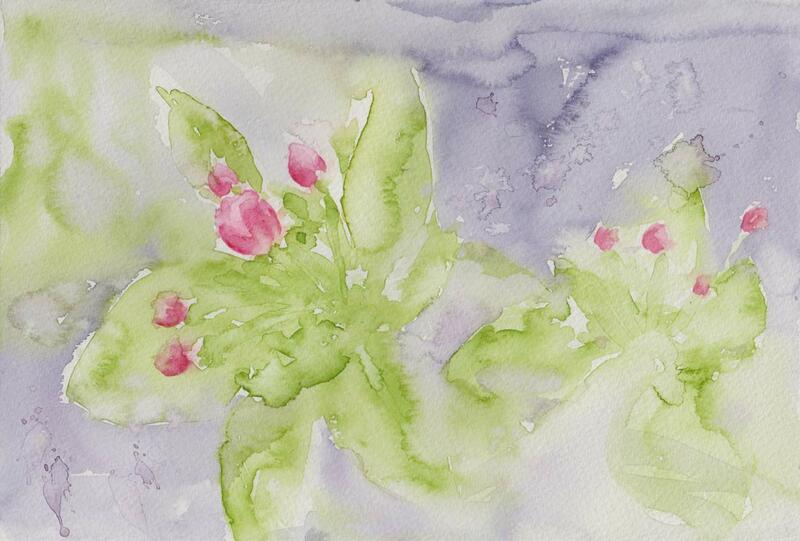 Anyway, I made a start with some slightly darker pigments around the edges of the main flowers and now have to consider what do to in the top left, which is a bit blank at the moment. 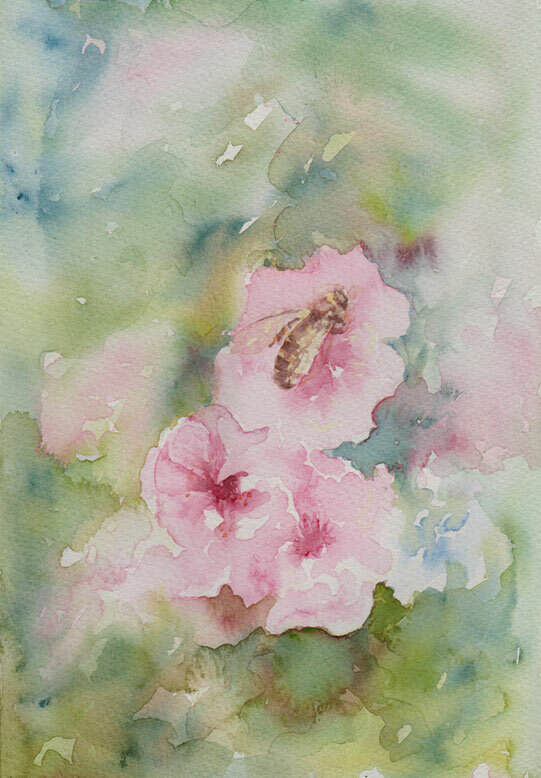 As you can now see, there’s a honey bee on the central flower and I would love to capture it’s fuzziness… I did try, but the pale yellow I used spread too far and disappeared. Perhaps I can add a light halo at the end instead. I might have lost one of his wings too…. there is a little masking fluid to save the whites, but I’m not sure now that it’ll be enough. Still happy 🙂 , more soon!